Also known as "drawing boards" or "architect's tables," antique drafting tables are prized by many home decorators and collectors of antiques. These large pieces are testament to the beautiful design and painstaking craftsmanship of the 19th century. Typically a fixture in an 18th or 19th century gentleman's office or study, drafting tables featured an adjustable surface to facilitate detailed drawing. Often this surface could be raised or lowered and could be tipped at a variety of angles. The architect or artist would generally use the table while standing, but sometimes, a tall stool could provide more comfortable working conditions. Some tables also featured a mechanism to adjust the height, so they could be used in a seated position. Display artwork on a drafting table. Adjust the table to its vertical position and attach a favorite painting, etching, or poster to the surface. The drafting table will highlight the work of art and will make it an immediate focal point in the room. Use a drafting table as a standing laptop desk. If you adjust the height to its maximum setting and make the tabletop level, you can use a drafting table a place to check your email or catch up on work without sitting down. 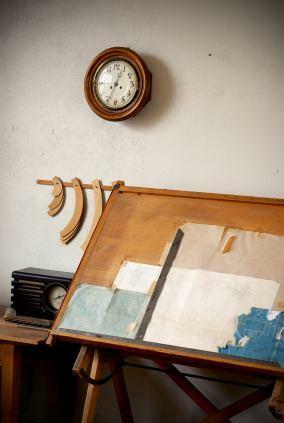 Use the antique drawing board as an artist's table. Even though the fields of architecture and engineering have embraced the computer design trend, many artists still work with pens and pencils. Drafting tables were designed for just this kind of use. Use a drafting table as a family message center. To do this, place the tabletop in its upright position, and adjust the table to its maximum height. Attach a chalkboard and several clips to the drafting table. You can then leave messages for family members and find important papers on your way out the door. You can also use a drafting table to display large antique books.